IPC 58th Anniversary: VRA Lecture on "Cultivating a Generation of Farmers"
The family that farms together, stays together – this quote suggests that families with members that farm collectively, remain united and to some extent in harmony with each other. This is with the assumption that all the family members have similar goals and inclinations which include working in the farm and staying in the community where the family land is located. However, due to intersecting factors brought by political, economic, and social changes, farming families are becoming more multifaceted than before. Literatures indicate that the global farming population continue to age while young people from their families are losing interest in farming. Views of the oldest and youngest generations about the said phenomenon has been widely studied. 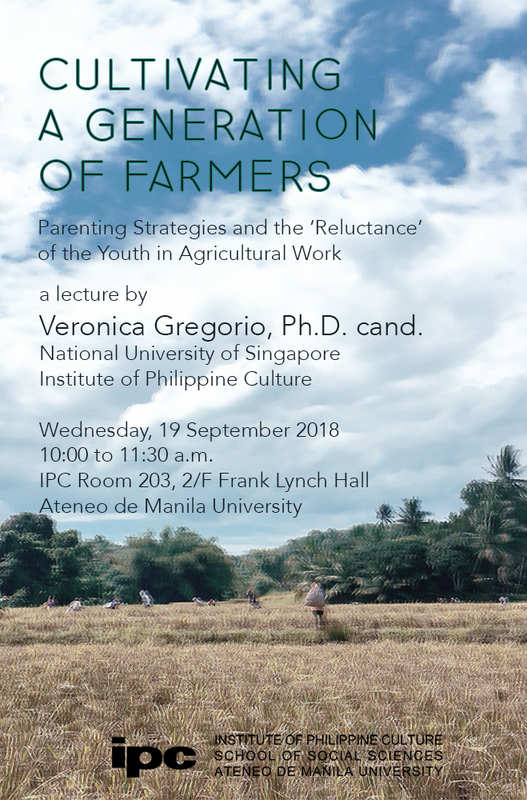 In this lecture, Ms Gregorio will show how the sandwich generation in farming families have much more to say about the “reluctance” of the youth in agricultural work. The empirical context is based on 25 key interviews and four months of ethnography in the municipality of Magsaysay, known as the rice granary of Davao del Sur in Philippines. The lecturer will put forward the following typologies of parenting strategies: (1) those who bulldoze the farm life of the child, (2) those who sow the child in the field, and (3) those who develop the child’s farming skills for contingency. Finally, the author will conceptualize “reluctance” as a product of the said parenting strategies in addition to the local and global portrayals of farming life as uncertain, demanding, and inferior. Veronica L. Gregorio is a PhD candidate from the Department of Sociology, National University of Singapore. Veronica’s dissertation project aims to compare the gendered practices and intra-household relationships of farming families in Philippines and Malaysia. Her current research interests include gender studies, rural development, and sociology of family. Prior to joining NUS, she studied her BA and MA at the University of the Philippines. Veronica is one of the recipients of the 5th Lourdes Lontok-Cruz Award for Best Thesis in Women and Gender Studies. She received the said award for her graduate thesis, Maagang pagbubuntis: Mga Kwento sa Likod ng Kwenta (2015).